QUIET RIOT continues their historic journey in 2017 with their new album, Road Rage. Led by drummer Frankie Banali, who is joined by veteran bassist Chuck Wright (who has been in and out of the band since 1982), guitarist Alex Grossi (who has been in the band since 2004), and new vocalist James Durbin, the band continues to be an unstoppable force in the rock 'n roll world. "The recordings for the new Road Rage record have been an incredible musical journey in the storied history of QUIET RIOT. I asked vocalist James Durbin to fill the very large shoes of the late great Kevin DuBrow because I knew he could. While no one can ever replace Kevin DuBrow, he has the same spirit and drive that Kevin had. James is an amazing live performer with insane vocal range, but he is also a very gifted songwriter and brought to the Road Rage record totally unique original lyrics and melodies. Not only do they fit perfectly to the music we wrote, but took the songs to a completely new level. All the work that we have put into this record has been well worth the wait! I am extremely proud of guitarist Alex Grossi, bassist Chuck Wright and especially James Durbin for the work we have created on this record. QUIET RIOT continues to tour relentlessly and will be on the road throughout the year. Expect to hear your QUIET RIOT favorites as well as new songs from Road Rage at our shows!" exclaims Frankie Banali. "The crown-jewel, on top of joining one of your favorite bands, has to be writing, recording & releasing a new album. No matter what, you are now a part of that band's history & I'm honored to have had the opportunity to do that with QUIET RIOT. I spent just over 3 weeks marathon song-writing brand new lyrics and melodies for every song & recording vocals. I'm extremely proud of the Road Rage record, not only that I had the band's support & trust to deliver, or how great of a personal accomplishment & blessing it's been, but that we can keep the QUIET RIOT freak flag flying & have the chance to inspire a new generation of fans!" Road Rage was originally scheduled for release in the Spring of 2017, but with the injection of newfound energy for the band with the addition of American Idol alumni James Durbin in the vocalist slot, the band decided to scrap the original sessions and record a new version of the album with the new and improved line-up. The results are everything QUIET RIOT fans could have hoped for! Road Rage is set for release August 4, 2017 via Frontiers Music Srl. QUIET RIOT is a rock & roll phenomenon. Famously known as the first heavy metal band to top the pop charts, the Los Angeles quartet became a global sensation thanks to their monstrous smash hit album, 1983's Metal Health. That album topped the Billboard album charts for several months and the follow up album; Condition Critical went double platinum. The band has continued to record and tour throughout the decades following. Frankie Banali's history with QUIET RIOT spans over 34 years and he has the distinction of being the only member of QUIET RIOT to have recorded on every single QUIET RIOT release since the release of their now classic album, Metal Health. After nearly ten years since the loss of his friend and bandmate Kevin DuBrow, and with careful consideration, soul searching, and the blessings and support of Kevin DuBrow's family, Frankie has moved forward with the band to bring the fans Road Rage! 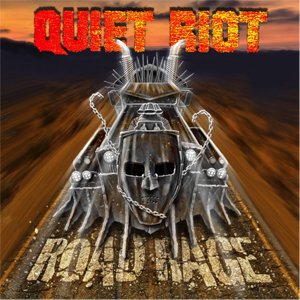 Musically, Road Rage offers exactly what you would expect from QUIET RIOT. Arena ready hard rock with strong hooks and infectious riffs, along with maturity in the songwriting that only a band with such a history and pedigree can offer. QUIET RIOT has come back stronger than ever, in perfect METAL HEALTH with the new album, Road Rage! Catch them on the road this summer!